It has been quite awhile since there has been a successful arena shooter. For those who enjoy playing arena shooters, their main options are Quake or Unreal Tournament. Don’t get me wrong, both games are great, but there is no doubt that they are a bit dated. Reakktor Studio’s upcoming game, Toxikk, takes the successful arena formula and applies it to a modern engine. 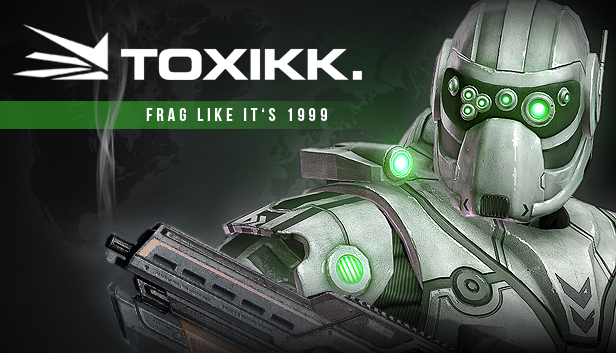 On January 22nd, Toxikk was released on Steam Early Access. For now, there is only one map and a few weapons, but this is enough to get an overall feel of how the game plays. As previously mentioned, the game plays like Unreal Tournament. The movement is fast paced, and you have the ability to dash, double-jump, and dodge. All the movement is extremely fluid, and the game typically reacts the way you want it to. In addition to fluid movement, the gunplay is also very functional. The weapon you spawn with is a rather weak pistol, but you can pick up more powerful weapons from timed drops around the map. When you encounter an enemy player, you have two options. The first option you have is to fight back with what you got. If you watch gameplay, it looks like the gunplay is spray and pray, but there’s a lot more to it than that. Depending on the gun, you often have to skillfully lead the enemy or be extremely precise with your shots. I will admit that sometimes it’s just as easy to spray and hope for the best, but that doesn’t always work out. If you don’t think you can fight back, your next option is to dodge and run away. If the other player chases you, you should try to flee towards a gun spawn. If you have the starting pistol, this is likely your best bet for surviving. In other cases, you have to make a decision based on what you have and what the other player has. In moments like this, knowing the map really pays off because you can quickly find a powerful weapon. The main purpose of the current Beta is to test weapon balances and core mechanics of the game. Reakktor seems to be using this Beta to their full advantage, as they are actively engaging in the community and listening to the feedback. Shortly after launch, a lot of the players were complaining about the rocket launcher being over powered. With little hesitation, Reakktor responded and said they plan to have a hotfix with changed damage values. While this doesn’t prove the weapon balance will be perfect, it does show that Reakktor is committed to keep updating the game in order to make it as good as possible. If you want to see their detailed roadmap, you can visit their forum post here. In all honesty, if you were to ask me whether you should get this game my answer would probably be “not right now”. The main reason is because the current version has only one map and a limited number of weapons and gametypes. However, within the next update or two there is going to be more maps, game modes, weapons, and vehicles . Of course, if you want to support the developers early on, then there isn’t much harm in buying this as long as you know what you’re getting. Like always, just remember this is an early access game and anything could happen down the road. Fortunately, I believe that Reakktor seems committed to their game and I have high hopes for the final outcome of Toxikk and arena shooters as a whole.